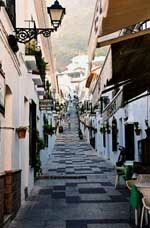 Mijas Malaga - Getting from Malaga airport to Mijas. Mijas is a municipality in the province of Malaga on the Costa del Sol next to Fuengirola. It’s a coastal municipality and the touristic activity is the main economic engine of this locality. The majority of the area that covers Mijas is mountainous and has 2 urban cores, one increasing on the coast and the other on the hillside of the mountain range at about 428 metres above sea-level with a typical character of an Andalusian white village. Mijas belonged to the turdetan people, Iberian people who lived mainly in the Guadalquivir valley, to the south of the Iberian peninsula. The turdetans were direct descendants of the Tartessians, who had a great Greek influence. The turdetans were considered by the romans as the most cultured people in the Iberian peninsula, with their own writing, laws and historical chronicles that dated back to 6000 years back then. The Phoenicians and Greeks also passed through Mijas, attracted by the abundant mining in the area. When the Romans arrived, they named it Tamisa and the place was an important trade focus till the fall of the empire, which was when they entered the area of the Visigoths. With the Muslims’ conquest of Malaga in the year 714, these allowed the inhabitants of Mijas to keep their goods and customs. As from then onwards, it was known as Mixa and its economic growth lasted until the Christian armies’ invasion in 1487, when they ended up surrendering and its population was sold as slaves. The houses and lands were reassigned to the Christians that were brought down from the north to repopulate the area. Due to the high piracy activity in the area, as from 1492 they built the watchtowers which alerted the population to fight them. These towers still stand today, so they can be visited at any time. 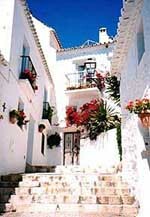 During the history of Mijas, agriculture and fishing have been important for its development, as well as the mining and cattle exploitation to a lesser extent, although the reason why Mijas really improved was due to the arrival of tourism thanks to the Costa del Sol’s international fame. The municipality of Mijas offers a great number of tourist attractions that we can visit; throughout the year they also celebrate numerous festivals in the open air during the summer months. Max’s Wagon: A collection of miniatures that includes a reduced human head. Historical-Ethnological museum: An ancient collection of tools. The Watchtowers centre: Located in the ‘Torre Nueva’ (New Tower) in La Cala del Moral and exhibits the history of the towers and of Mijas. - Virgen de la Peña chapel: A chapel excavated in the rock between 1656 and 1682. - San Sebastian church: From the late 17th century with religious wall paintings. - Inmaculada church: A church from the 17th century situated on the top party of the village, built upon an old mosque conserving its tower as a belfry. - Calvario chapel: Built in the early 18th century on the foothill of the Mijas mountain range. - San Antón chapel: Built during the 18th century. - Gardens of the Wall: Gardens built upon the old fortress that surrounded the village of Mijas. - Watchtowers: As previously mentioned, these towers were used to watch out for the safety of Mijas, defending it from possible pirate attacks. They are distributed all along the Costa del Sol’s coast. La Cala: Situated in La Cala de Mijas, where they occasionally organise and celebrate concerts and nocturnal festivals on weekends. Rocky cape: An excellent beach for windsurfing, sailing and scuba diving. Calahonda: A good beach for fishing or snorkelling. El Bombo: A Mijas beach situated next to a cliff, ideal for scuba diving. El Chaparral: A rocky beack where there is normally quite a lot of swell. El Faro: Ideal for spearfishing or with rods and hosts several little coves. If we want to get to Mijas from any other place, we can use our own way of transport, a transfer or a bus, there is no train service to Mijas, although sometime in the future it is planned on its way to Marbella. This way of transport appeared around 1950. The ‘burrotaxi’ is preserved today as a tourist attraction and they even have their own special donkey taxi rank. Town council: Plaza Virgen de la Peña, s/n. 29650.